85% LESS FAT THAN TRADITIONAL PEANUT BUTTER: We take USA-grown high oleic roasted peanuts and extract the oils, leaving you with all of the protein and natural flavor of peanuts without the fat! Plus only 45 calories per serving. Compare that to 190 calories per serving of traditional peanut butter, and you’ve found a great new way to count calories! EASY TO USE: To create spreadable peanut butter, simply mix 2 parts powder with 1 part to water. Want to make a delicious, healthy protein shake? Add 2-3 scoops of Tru-Nut into your smoothie blend to add a great natural peanut flavor and lots of protein! Love to bake? Use Tru-Nut as a substitute for peanut butter in your favorite baked goods recipes. Or if you just want to keep it simple, sprinkle some Tru-Nut on your morning cereal, oatmeal or bowl of ice cream! HEALTHIER OPTION: Tru-Nut is loaded with 5 grams of peanut-derived plant protein per serving. Give yourself a boost of energy in the morning without having to drink caffeine. All of our products are Non-GMO, Gluten Free, All Natural and Vegan. And we don’t use preservatives, flavorings or palm oil in any of our productts. WHY TRU-NUT: We only use high oleic peanuts grown in the Southeastern United States. High oleic peanuts are fresher and tastier than regular peanuts, making Tru-Nut a better choice for all of your culinary creations. From a peanut butter and jelly sandwich to a peanut stir fry dish, the possibilities are endless! Tru-Nut contains 85% less fat than traditional peanut butter. Use it in protein shakes and smoothies or mix it with water to create spreadable peanut butter. 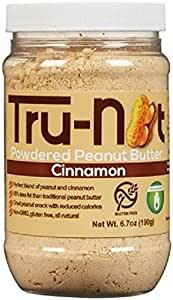 Tru-Nut is all-natural, non-GMO and gluten-free. Our cinnamon flavor is made with Indonesian korintje cinnamon, to contribute a mild but warming cinnamon flavor. 5.0 颗星，最多 5 颗星Excellent When Paired with Other Food Items. If you are looking for something that tastes JUST LIKE PEANUT BUTTER don't bother. This product has had the sugar and oil removed - so it's not sweet and creamy. It is however pretty tasty. I have the cinnamon flavor and I find that it gets me about as close to a Biscoff cookie as I can get without the calories. I mix it up and put it on celery for an evening snack. Apple slices, smoothies as well. This is not very tasty if you eat it straight without pairing it up with other food items. Understand the applications for the product and you won't be disappointed. Exactly as described, this product was great but I definitely prefer real peanut butter. I like how easy it is to add to whey protein on the go. 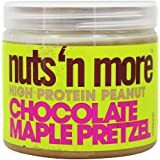 Two or three tablespoons of this with a scoop of whey in a shaker.. all you need is water and you have an instant high protein shake on the go. It's a little grainy compared to real peanut butter; In the blender I prefer the real thing, fat and all. I used regular peanut butter in my protein shakes in the morning; figured I'd try to cut out some calories and try this stuff. I honestly barely taste it at all in my shakes, and I've put in two big spoonfuls at times. If you want the great taste of peanut butter in your protein shakes, just put in a spoonful of the real stuff. I don't want to use the other brands b/c they have added sugar. I'd rather just get the natural fats/calories from real PB than added sugar into the powdered stuff. 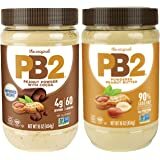 I like this peanut flour the best .I use in cooking smoothies and just plain.This does not taste like peanut butter because no fat or sugar added .When I make it for spreading on crackers or apples sometimes I put a little stevia in to sweeten .I tried this flavor , maple , but really don't taste much flavor .I use this item because I had bariatric surgery and want to maintain my weight loss but I would never say it taste like regular peanut butter. 5.0 颗星，最多 5 颗星So versatile! I can sprinkle it on whatever I want to have a peanutty taste boost. Great for adding to my emergency food storage line up. 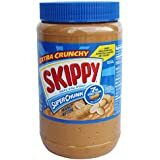 I like that it has less fat than regular peanut butter and it can be used easier in oatmeal, as a coffee flavor enhancer, in pancakes etc. I like to sprinkle some on my brownies YUM and waay better than the box of cupcakes they have that imitates a reeses.